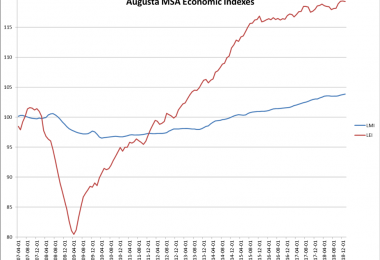 The 3rd quarter economic data for the Augusta Metropolitan Statistical Area (MSA) is in and the Labor Market Index (LMI) decrease 0.1% over the last three months. 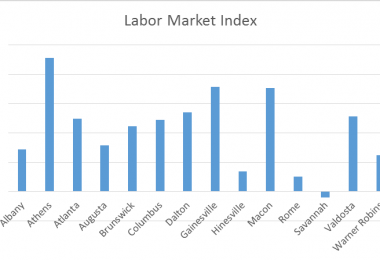 The number of people employed locally has barely changed since February and currently stands at 242,200 but the unemployment rate has declined 1.2 percentage points since the beginning of the year to 3.7%, the same as the national rate. 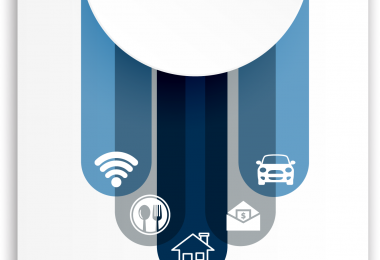 Despite the scarcity of unemployed workers, average weekly earnings have remained flat, averaging $800 this year. Worryingly, 6,000 people have left the local workforce since a high in March and in June average weekly hours worked were the lowest recorded for Augusta at just 33.4 hours. 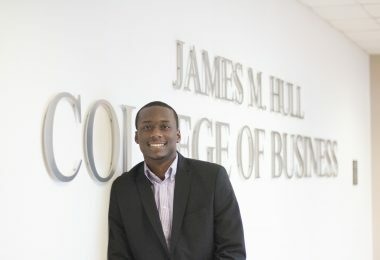 What about the outlook for the next few months? The Leading Economic Index (LEI) has seen two consecutive monthly increases but still remains below the level of a year ago. 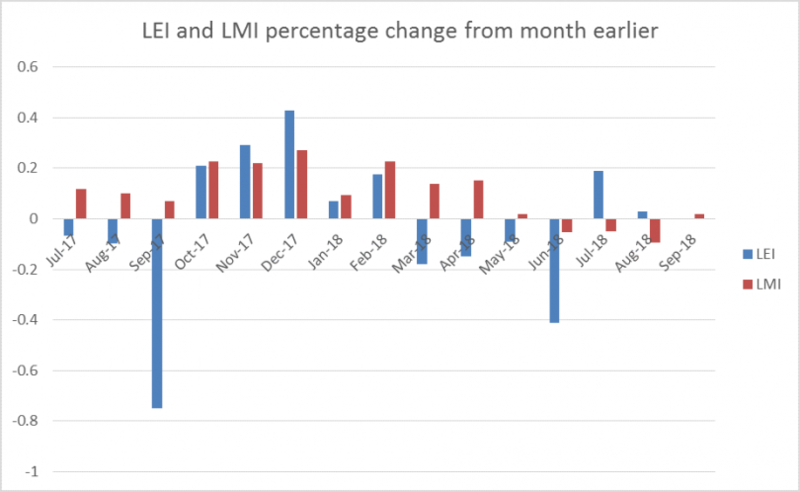 Changes in the LMI tend to lag changes in the LEI so the increases in the LEI in the fourth quarter of 2017 suggest the fourth quarter of 2018 may be better than the third quarter. 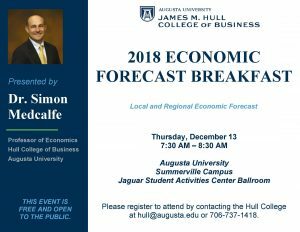 I will give a more detailed analysis of this year and my outlook for 2019 in my annual Economic Forecast Breakfast scheduled for Thursday December 13th at 7:30am. 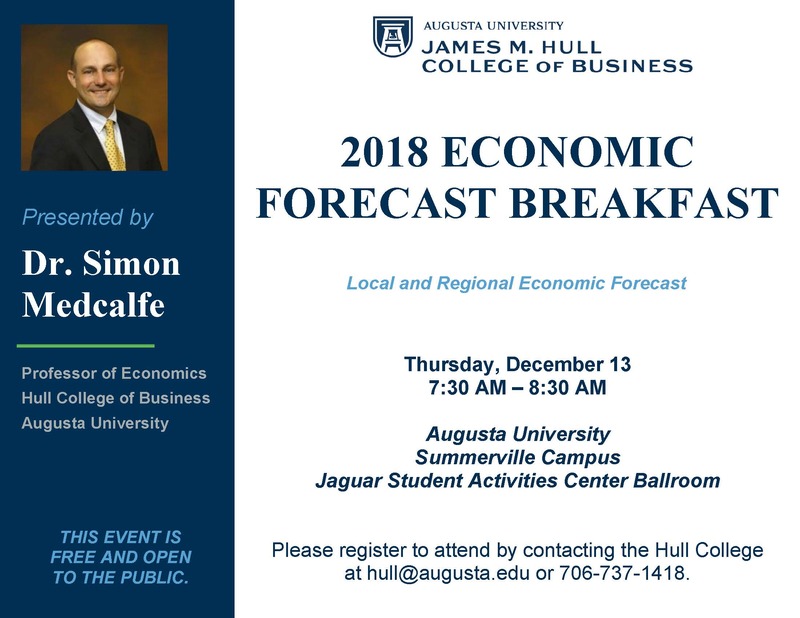 Please RSVP to HULL@augusta.edu or 706-737-1418. If you would like to receive our monthly Economic Updates in addition to this quarterly Economic Commentary, please join our Economic Updates mailing list. 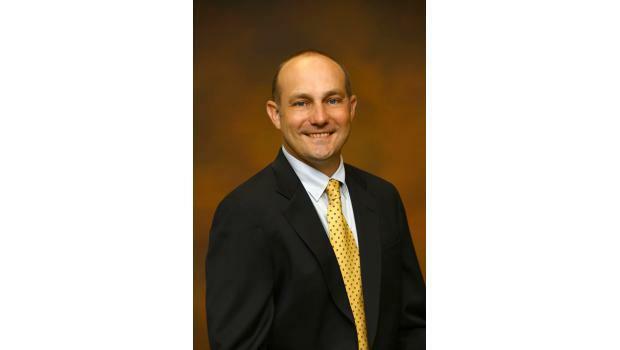 Commentary provided by Dr. Simon Medcalfe, Professor of Economics and Finance at the James M. Hull College of Business at Augusta University.